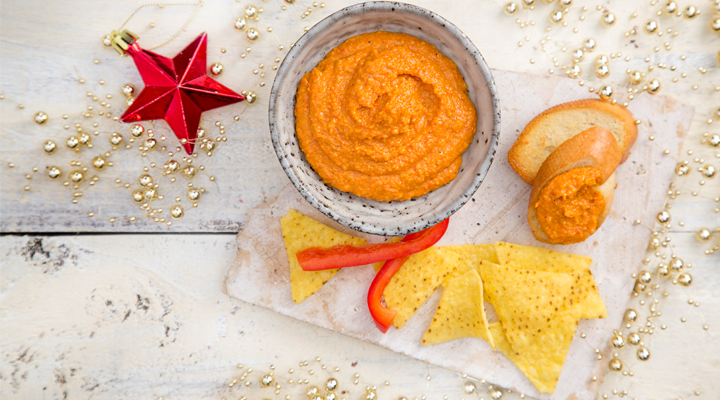 Here is our version of the classic Spanish sauce made with almonds, garlic and red peppers. Our version is more like a pesto than a sauce, and it works great in almost anything. It will keep in the fridge for up to 10 days. Slice the sides and the ends off the peppers and put them on a baking tray along with the whole heads of garlic. Put the almonds on a separate tray. Put both trays in the oven. Roast the almonds for 10 to 12 minutes, until they start to darken and smell lovely and roasty. Remove the almonds from the oven, but continue to roast the peppers and garlic for 30-35 minutes in total, until the peppers start to char around the edges and are well cooked. Once the peppers and garlic are done, transfer to a food processor and add the almonds, vinegar, salt and spices. Blend for about 7 minutes, until pretty smooth. At the end, slowly add the olive oil so it blends better and comes together easier.